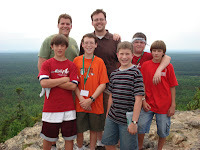 As soon as we returned from our California trip, Matt and I left early the next morning for Presque Isle, Maine to join our Youth Group up there to put on several Vacation Bible Schools. We left MJ with Mom and Dad for a week of EXTRA spoiling from Mommom and Pappy while Mommy and Daddy were away for a week. 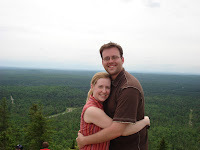 Matt and I really enjoyed our trip to Maine. It was a great time of service to the people of Presque Isle, New Sweden, and Stockholm, Maine, time to enjoy the beauty of God's creation out in nature, time of developing stronger relationships with the teens in the youth group, and simply time to reflect on God and worship Him. This was the 10th consecutive year that our church has sent a group up to these 3 cities to minister. (My 1st year to go and Matt's 2nd). We put on a Vacation Bible School for the children and I was in charge of Crafts, while Matt kept things exciting by heading up Game time for the children. The top left picture is of Matt and Dusty and some of the boys from their 7th grade Small group. The top right is of Matt and I after climbing Mt. Haystack in Maine. The bottom left picture is of the teens from our group who were on my Craft team...they did a fabulous job! 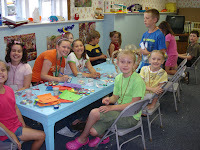 The bottom right picture is of Craft time at one of the locations for VBS. Overall, we had a great trip and look forward to going again next June. Hi Matt, Melissa, & Michaela. We love all of your new pictures and we are so glad to hear you had such a wonderful trip to California and to the beautiful state of MAINE! Presque Isle certainly is WAY, WAY UP THERE in Maine! It takes well over six hours to get there from our home in Limerick. My father has been talking and dreaming about driving up to Presque Isle for years & years now but he hasn't quite yet convinced my Mom! :) He has even done quite a bit of research about that area. You'll have to tell my Dad all about your trip when you see him in August. 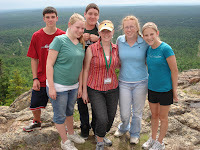 I'm sure all of your hard work with the teens on your trip was an unforgettable and life inspiring experience for them. Hopefully when you come to Maine again next year we can some how arrange a visit to see one another. P.S. Micheala is as cute as can be in the pictures below. She must be thrilled with her new Barney! Wow---you were in Maine! Uncle Walter has been wanting to go to Presque Isle for a long time! Bob keeps telling me that it will be a very, very long drive up there without a whole lot to do once we finally arrive. I can't wait to hear all about it from you. We'll be coming to New Jersey & Deleware soon. We cannot wait to be with our family again and meet Michaela. She is so very, very pretty! It'll be great fun to spend time together. P.S. Kiss and hug Michaela for us until we can do it in person!